Hadiya told the bench, “I want my freedom. 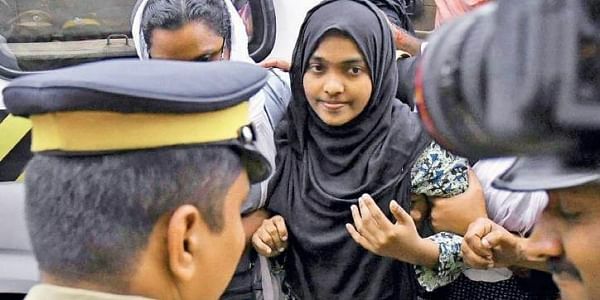 I have been in unlawful custody for last 11 months.” Before Hadiya spoke in the court, the court and National Investigation Agency were engaged in a debate for nearly two hours and told the bench that there were at least 11 cases in Kerala of forced conversion for terror.The NIA wanted its probe report into alleged instances of conversions in Kerala before speaking to Hadiya. The woman’s father insisted for an in-camera hearing which was opposed by the husband’s lawyer. Jehan had on September 20 approached the apex court seeking recall of its order directing the NIA to investigate the controversial case of conversion and marriage. The Kerala High Court had annulled the marriage terming it as an instance of ‘love jihad’, following which he had approached the apex court. Ashokan KM, Hadiya’s father, had alleged that there was a “well-oiled systematic mechanism” for conversion and Islamic radicalisation. During the hearing, Additional Solicitor General Manider Singh, appearing for NIA said, “Findings of NIA critical in nature. There are 11 other such cases and 7 cases are arising out of the same organisation – Satyasarini.”Senior advocate Shyam Divan, appearing for Hadiya’s father, also submitted transcript of a voice clip of alleged ISIS recruiter Abdul Rasheed to show his association with the Popular Front of India, an Islamic fundamentalist organisation Jahan was allegedly connected to. The next hearing is in third week of January. Chief Justice Dipak Misra felt he has never seen such a case in his life. Is Hadiya’s a case of conversionists using loopholes or love beyond religions?